It has been over a year since we've reviewed thermal paste. With the previous presented to us being Arctic Cooling's excellent MX-2 thermal compound in July 2007 and reviewed August 2007 -- it was, no doubt, excellent thermal paste; and were able to achieve a score of 8.1/10 on our Number Ratings. Thermal paste may seem so insignificant -- it can be easily overlooked to an extent that many people simply buy what they've heard of the most, and not necessarily what is the best. Thermal paste may 'seem' to be all the same with each other; but each is actually quite unique with different companies making different formulas for synthetic compounds or metal compounds. But all serves the same purpose to allowing better transfer between the cooled device and the cooler; filling microscopic valleys in surfaces that has microscopic imperfections to maximize heat transfer efficiency at its source. Today, we will be looking into several different brands of claimed 'high performance' thermal paste and see which one performs the best. Our four-way competition today includes the 'classic' Arctic Silver 5, our previous winner Arctic Cooling MX-2, the price competitive Tuniq TX-2, and the NT-H1 paste from silent PC enthusiasts' favorite company Noctua. Let us first look at the classic Arctic Silver 5, which has been one of the longest selling and still one of the best known thermal interface material brand -- but after years and no new changes to the product, how well does it hold up to the reputation it has built up? It is still widely sold throughout major markets such as North America and Europe. Normally when purchased, the packaging for the Arctic Silver 5 is pretty much non-existent -- all you'll get is the familiar microscopic gray syringe. It only comes in the two sizes with no other forms of packaging commonly available. The 3.5 gram tube as seen above, is completely made of plastic and has a small black cap to cover the tip, but the syringe pressure applier at the top can be pulled out to act as a really effective thermal paste spreader. Application wise, Arctic Silver 5 is not runny, and spreads generally very well -- it sticks to surfaces easily as it is really 'heavy' paste for easy application, which is very good. Overall, the syringe design is solid and works well for applying the thermal paste itself, even if it's not the prettiest to look at. But as far as thermal paste goes, it's function over form/packaging, right? Arctic Silver 5 is a polysynthetic silver based thermal paste; which means it includes silver and multiple heat conductive synthetic ceramics in the paste. This makes the paste a very good conductor of heat, but even as it is formulated to conduct heat and not electricity, it is still somewhat conductive and can cause trouble in the right situation. Arctic Silver 5 needs about 200 hours of break-in time for it to reach its peak performance. It is available in a 3.5 gram tube and a 12 gram tube. A 3.5 gram tube will only last the user about 8 applications on average as per Arctic Silver's website. Realistically, the user would most likely only get around 6 applications. The 12 gram tube is much larger and would likely be able to last around 26 different applications as calculated. Performance: 3 to 12 degrees centigrade lower CPU full load core temperatures than standard thermal compounds or thermal pads when measured with a calibrated thermal diode embedded in the CPU core. Factoring in average retail price at press time, that's a calculated average of $1.72 per gram in 3.5 gram form and $1.50 per gram in 12 gram form. No density information is given, so volume information is not available. Next up is our August 2007 favorite, the Arctic Cooling MX-2, which is a fully synthetic non-metal based paste that contain absolutely no traces of metal particles. It's not electrically conductive, and we have accidentally spilled some into our LGA775 motherboard socket last year with zero side effects. Such pastes are becoming much of the norm in today's thermal pastes over metal particle based products. The packaging for the 4 gram tube of Arctic Cooling MX-2 is a blister pack containing the thermal paste tube inside; with Arctic Coolings's signature colors of black and white color scheme on the packaging. The 30 gram tube is almost identical in packaging -- the only difference is that instead of a blister pack, it comes in a box. Removing the cap at the bottom of the syringe allows paste to be easily and precisely pumped out the bottom for application. Arctic Cooling recommends applying a small amount in the middle of, say, a CPU, and spread it with the heatsink on top. The paste is wet and flows easily not not necessarily runny, making it very easy to apply -- but behaves much 'lighter' than Arctic Silver 5 as it does not contain any metal particles. Arctic Cooling advertises their thermal paste as not only non-electrically conductive, but also low thermal resistance. This means that heat will transfer through this product easily. Theoretically, it has no break-in time, but it works the best after a day or two. Arctic Cooling MX-2 is available in the form of a 4 gram tube and a 30 gram tube. A 4 gram tube lasts for about 7-8 applications, while a 30 gram tube is for frequent builders and/or CPU heatsink swapping enthusiasts that need... well, a lot haha. Factoring in average retail price at press time, that's a calculated average of $1.75 per gram in 4 gram form and $1.34 per gram in 30 gram form. Since volume determines how many applications you would get, the calculated price to volume ratio is $6.41/mL in 4 gram form and $5.15/mL in 30 gram form. Our third contestant we have is the Noctua NT-H1, a 'relatively newcomer' to the thermal paste market (When we got it anyways, which is January this year haha). Noctua is known to produce quiet and efficient computer thermal solutions; and their case fans and heatsinks that are highly regarded in the enthusiast market for both performance and quietness. The Noctua NT-H1 thermal paste's packaging is done with a standard non-blister clear plastic packaging with cardboard backing. Both the tube of thermal paste and its retain package retains the usual Noctua colors of burgundy, black and blue. The thermal paste itself, again comes in the form of a syringe. Noctua's NT-H1 is yet another non-metal synthetic thermal compound, which means that it is fully non-conductive and won't risk shorting your components if you accidentally got some on undesired locations. Noctua's NT-H1 only comes in 1.4 mL (3.5 grams, not 3 grams, according to Noctua) tubes; 15 applications is specified by the manufacturer as the volume is greater than its competitors for its volume to weight ratio -- although we've yet to test this. But since it only comes in one size, this means that users who need a load of thermal paste won't be able to get any discounts in buying bulk. The $8.95 retail price makes this our most expensive paste tested today. Noctua's NT-H1 paste feels dry and somewhat light; making it hard to spread -- again, the manufacturer recommends putting a small amount in the middle of the applied surface and let the heatsink spread it. Break in time is minimal; we noticed no performance gain a few hours after application. Factoring in average retail price at press time, that's a calculated average of $2.56 per gram in 3.5 gram form. Since volume determines how many applications you would get, the calculated price to volume ratio is $6.40/mL in 3.5 gram form. 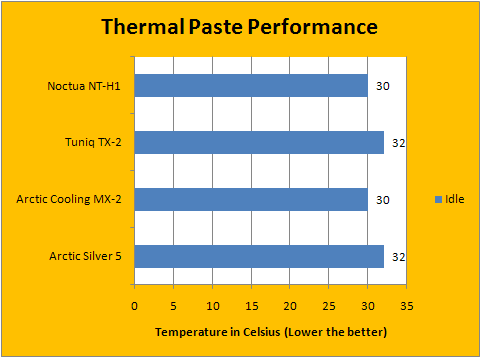 Finally, we have the Tuniq TX-2 thermal paste. Relatively new to the market (Again, we are counting the date we got it, which is May this year haha). Although the Tuniq brand may seem unknown to some, the company behind it is not. Tuniq is a subsidiary of Sunbeam Tech, a company specializing in computer cooling solutions ranging from heatsinks, case fans, to computer cases. Our Tuniq TX-2's retail packaging is very simple -- sealed in a plastic bag with nothing more than a bar code and its name at the top. The syringe itself is identical to the Arctic Cooling MX-2 syringe, even the label is black -- the only difference is the branding. Wait a minute, "MX-2", "TX-2" -- coincidence? Pretty much all of the latest thermal pastes in the market right now are non-metal synthetic compounds. The Tuniq TX-2 is no exception, making this the third fully synthetic thermal paste that will be tested in today's report. Like Arctic Silver 5, the Tuniq TX-2 comes in a 3.5 gram tube -- no larger option is available. When it comes to application, the wet, easy to apply, and relatively light TX-2 compound behaves pretty much the same way Arctic Cooling's MX-2 does. Break in time is minimal; but I would give it around 2 days for peak performance. The 3.5 gram tube will probably last around 6 applications before it is all used up. * Small molecular size makes a better contact between the heatsink and heatsource. Factoring in average retail price at press time, that's a calculated average of $1.09 per gram in 3.5 gram form. Since volume determines how many applications you would get, the calculated price to volume ratio is $4.31/mL in 3.5 gram form. - All pastes were given an adequate amount of time to settle. Data is collected over time, and its peak consistent score is used as the result. - Because tests were run on different days due to the reason listed above, our lab temperature is strictly controlled and air conditioned to maintain a temperature of 23 degrees Celsius. - The platform used in testing are okaced in the exact same location and position in the room throughout all of our tests. - Both the CPU and heatsink base were thoroughly cleaned off using 70% isopropyl rubbing alcohol between all tests. - The test platform is turned on and idling for a minimum of 30 minutes to obtain idle test results. CPU load is maintained below 2% at all times. - High CPU load results were obtained using Orthos Small FFTs tests for maximum heat generated by the processor, ran for a minimum of 30 minutes before results are taken. Using our Intel Pentium Dual Core E2140 running at 3.08GHz with 1.4V and our full copper Asus Silent Knight II heatsink, test results were obtained using the controlled conditions listed about. 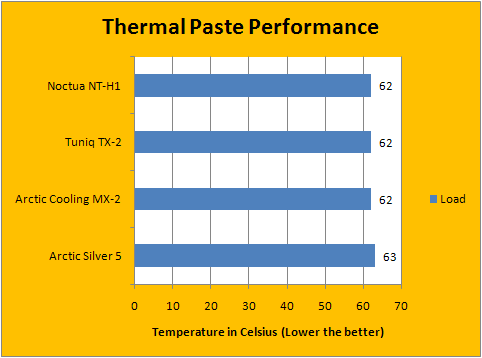 The results of all compared thermal pastes are quite comparable across the board. Arctic Silver 5 and Tuniq TX-2 managed to get recorded temperature of 32c, while the Arctic Cooling MX-2 and Noctua NT-H1 were able to bring it down two extra degrees to 30c -- besting the other two and tied each other. In our load tests, our results were again quite comparable -- but not necessarily the same way as before. This time, the fully synthetic pastes all managed to get a load result of 62c, while the only polysynthetic silver paste, Arctic Silver 5, recorded a degree higher in our results of 63c. Arctic Silver 5, once the king of all thermal pastes and seems to be so invulnerable to challenges, is beaten by everyone else. It's interesting how history works. Let's do a recap. Arctic Silver 5 comes in at $1.72 per gram in 3.5 gram form and $1.50 per gram in 12 gram form. Arctic Cooling's MX-2 comes in at $1.75 per gram in 4 gram form and $1.34 per gram in 30 gram form, price to volume ratio is $6.41/mL in 4 gram form and $5.15/mL in 30 gram form. Noctua's NT-H1 retails for about $2.99 per gram in 3 gram form, price to volume ratio is $6.40/mL in 3.5 gram form. Tuniq's TX-2 thermal compound comes in at $1.09 per gram in 3.5 gram form, price to volume ratio is $4.31/mL in 3.5 gram form. Noctua's paste appears to be the most expensive when it comes to weight, but in actual practicality volume calculation it is actually a few cents lower when compared to the average retail price of Arctic Cooling's MX-2. Tuniq's TX-2 is still the cheapest in all calculations. In our tests, Noctua's NT-H1 tied the Arctic Cooling MX-2 in performance. While it has excellent (Pretty much no) break time, it's not necessarily easy to apply due to its nature -- where the MX-2 is one of the easiest pastes to apply; also with very little required break time. But considering our performance numbers, most users should be glad that a small tube of Noctua NT-H1 paste comes with Noctua heatsinks. On the other hand, Tuniq's TX-2 tied Arctic Silver 5 in our idle tests and even beat it in our load tests -- and the best priced product of our report today at $1.09/gram and $4.31/mL, it offers a surprising good amount of performance for your money -- not to mention its easy-to-apply characteristic. Arctic Silver 5... you've had your glory, but it's time for you to retire. Special thanks to Colin over at Arctic Silver, Patrick over at Arctic Cooling, Jakob over at Noctua, and Derek over at Tuniq for making this report possible. Best Overall: Arctic Cooling MX-2 ($1.75/g & $6.41/mL @ 4 grams, $1.34/g & $5.15/mL @ 30 grams). posted 5 hours and 35 minutes ago, with 12 posts. posted 5 hours and 35 minutes ago, with 9 posts. posted 5 hours and 36 minutes ago, with 3 posts. posted 5 hours and 38 minutes ago, with 4 posts. posted 5 hours and 40 minutes ago, with 56 posts.